The Param Vir Chakra is the highest gallantry award in the Indian armed forces given for valour in battle. Only an extraordinary act of bravery and courage symbolizing the spirit of “Service before Self” merits this award. Instituted in January 1950, twenty-one brave heroes of our armed forces have so far been honoured with this Award, out of which fourteen made the ultimate sacrifice of their life and were given the award posthumously. The lives and brave acts of these twenty-one heroes make for a truly inspiring read. Courage is a rare virtue and deserves appreciation and recognition whenever shown. This trait is all the more admirable when it is selfless such as when soldiers risk their lives to protect their country and countrymen. Battlefields provide ample opportunities to show valour and it is here where most acts of courage have been performed across the world and governments since ancient times have recognized heroic acts by award and honours. The British constituted the Victoria Cross, a gallantry award, in 1856 to honour brave soldiers. 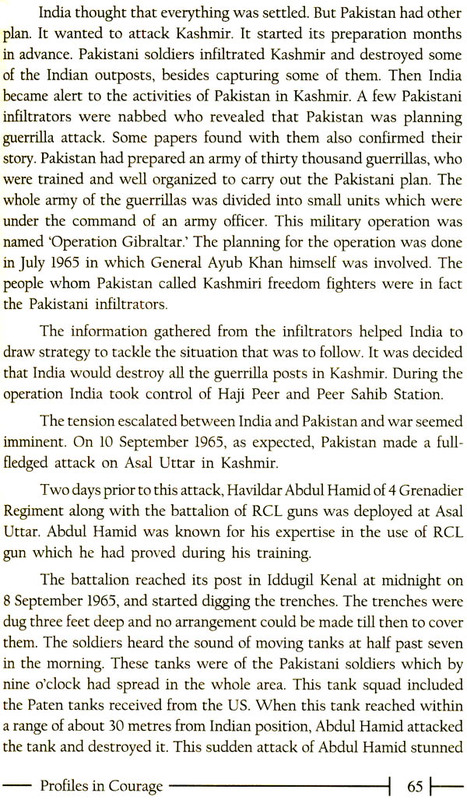 As India was under their rule at that time, Indian soldiers also would get the same award for their acts of bravery. After independence, India established three gallantry award for the armed forces; Param Vir Chakra, Maha Vir Chakra and Vir Chakra. Among these the Param Vir Chakra is the highest bravery award for officers of all defence forces. The word Paramvir means “bravest of the brave” in Sanskrit. The Param Vir Chakra is awarded or exhibiting exceptional valour against the enemy in the battlefield. It was established on 26th January 1950 by the President of India with retrospective effect from 15 August 1947. Male and female officers of the Indian army, navy and air force are eligible for the Param Vir Chakra. Besides, personnel of the Reserved Forces, Border forces and any other branch of defence forces which has been recognized as a part of the armed forces, can receive this award. Both male and female personnel serving in the army hospitals such as nurses and matrons, whether temporary or permanent, are also eligible for this award. Param Vir Chakra is awarded for exceptional courage shown against the enemy, whether on earth, in the sea or air. This honour can also be given posthumously. If a person who has already got this honour, performs a brave act again, a line will be drawn on the ribbon of his medal to indicate this. This line can be drawn more than once. The recipient can wear a replica of the award on certain occasions. The President of India Present the Param Vir Chakra on the Republic Day. If awarded posthumously, it is given to the widow, the parents or the immediate relative of the martyr. The medal is in the shape of a bronze coin which has a radius of 3/8 inch. In the centre, on a raised circle, is the state emblem surrounded by four replicas of vajra (Lord Indra’s weapon). On the other side, the words Param Vir Chakra are embossed in both English and Hindi. Between these two, lotus flowers. The ribbon ;which holds the medal is 2mm long and is purple in colour. The Param Vir chakra was designed by Mrs. Savitri Khanolkar whose real name was Eva Younne Linda Maday-de-Maros. She was a citizen of Switzerland who married Indian army officer Vikram Khanolkar and became a Hindu. Major General Hira Lal Atal was given the responsibility for designing and naming India’s new gallantry award. But he chose Savitri Khanolkar for this task as she had deep knowledge of Indian mythology, Sanskrit and Vedas. She was also a painter and artist. Major General Hira hoped that she would be able to design a medal according to Indian culture and tradition. Incidentally by the first Param Vir Chakra was awarded posthumously to her daughter’s brother-in-law, Major Somnath Sharma, who lost his life in the 1947 Indo-Pak War. So far twenty-one officers have received the Param Vir Chakra. Twenty of these recipients are from the Indian Army and only once comes from Indian Air Force. Fourteen awards were given posthumously. The Grenadier Regiment has received the most Param Vir Chakras till date. It has got three awards, one each for Indo-Pak Wars of 1965,1971 and one for the Kargil war fought in 1999.